After day-long face-off, all eyes on Sartaj Aziz’s press conference today. Pakistan remains willing to attend the NSAs meeting without any pre-conditions, the press release further said. The National Security Advisor-level talks between India and Pakistan looked increasingly unlikely after a day-long face-off over a proposed meeting between Pakistan’s NSA Sartaj Aziz and Hurriyat leaders led to India saying that the “distortion of the agreed agenda cannot be the basis for going forward”. Late at night, Pakistan responded by saying it was “deeply disappointed” at India putting forth “pre-conditions” and accused Delhi of coming up with “frivolous pretexts”. Both sides, however, stopped short of calling off the talks scheduled in New Delhi on Sunday but a breakdown seemed more likely than a breakthrough. A senior Pakistan diplomat told The Indian Express: “It would make no sense to have this meeting now. We need some time to reflect and then see how to re-engage. One thing is clear though — we are not in a position to pay for India’s overreaction on the Hurriyat last year. India must not expect us to compromise on this central issue. We can wait as much as it takes”. For the record, though, both sides said they were committed to talks. Indeed, Pakistan sources maintained that Aziz would reach India on Sunday at about 3 pm, meet Hurriyat leaders that evening, and meet Hurriyat leader Syed Ali Shah Geelani separately at about 9.30 am on Monday before talks with India’s NSA Ajit Doval start at 11 am in Hyderabad House. That, however, looks remote now and all eyes are on Aziz’s press conference scheduled for 1 pm tomorrow. The NSA-level talks was agreed upon by the Prime Ministers of both countries during a meeting in the Russian city, Ufa, last month. Tension escalated on Friday morning after Pakistan rejected India’s “advice” that “it would not be appropriate for Sartaj Aziz to meet with Hurriyat representatives during his visit to India”. In its response, Pakistan said that “it would not be possible… to accept this advice”, and that Aziz was willing to meet Doval without any pre-conditions. It underlined its objection by saying Kashmir is a “disputed territory” as per the UN Security Council resolutions, which remain “unimplemented”. MEA spokesperson Vikas Swarup, however, said that any meeting between Aziz and the Hurriyat representatives “would not be in keeping with the spirit and intent of the Ufa understanding to jointly work to combat terrorism”. He also indicated that the two sides were yet to agree on the agenda for the talks. “We have also sought confirmation of our understanding of the agenda for the NSA-level talks that was conveyed to the Pakistani side on August 18, 2015,” he said. While the Indian side wanted to talk on terrorism — as agreed in Ufa between the two PMs — the Pakistan side wanted to discuss “all contentious issues, including Jammu & Kashmir”. In its statement, Islamabad said that the Pakistani leadership has always interacted with the Kashmir/Hurriyat leadership, during their visits to India. “Pakistan sees no reason to depart from this established past practice. The Hurriyat leaders are true representatives of the Kashmiri people of the Indian-occupied Kashmir. Pakistan regards them as genuine stakeholders in the efforts to find a lasting solution of the Kashmir Dispute,” it said. Pakistan has proposed and conveyed to India a comprehensive agenda reflecting the broad understanding reached between the leaders in Ufa, that all outstanding issues, including Kashmir and other disputes, as well as terrorism issues and other CBMs, will be discussed between the two countries, it said. “India’s insistence to introduce conditionalities and restrict the agenda for the dialogue, demonstrates a lack of seriousness on India’s part to meaningfully engage with Pakistan,” it said. Swarup responded by saying that Pakistan’s statement “does not come as a surprise”. “There has been a pattern to Pakistan’s actions after the Ufa Summit and today’s position is a culmination of that approach,” he said. At Ufa, he said that the two Prime Ministers agreed on a meeting of the NSAs to discuss all issues connected to terrorism as well as ensure peace and tranquility on the border. “Instead, we saw a sharp increase in the unprovoked firings from the Pakistani side and some serious cross border terrorist incidents. The last one, at Udhampur, resulted in the capture alive of a Pakistani national, a matter that would have naturally come up in the NSA level talks on terrorism, to Pakistan’s discomfort”, he said. 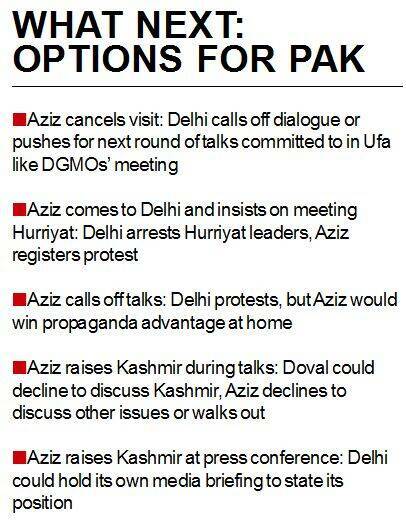 As for the talks, he said Pakistan took 22 days to respond to the Indian proposal to meet in New Delhi. “It then proposed an agenda that was at complete variance with what the two Prime Ministers had agreed upon in Ufa. Together, these two actions indicated its reluctance to go forward with sincerity on the agreed process. Even more significantly, without confirming either the programme or the agenda, the Pakistani High Commissioner invited Hurriyat representatives to consult with the visiting NSA. This provocative action was completely in consonance with Pakistan’s desire to evade its commitment at Ufa to engage in a substantive discussion on terrorism,” the MEA spokesperson said. He said that the Ufa understanding on the talks — read out jointly by the two Foreign Secretaries — was very clear: the NSAs were to meet to discuss all issues connected to terrorism. This was the only agenda set for them by the two Prime Ministers. ”The people of both countries can legitimately ask today what is the force that compels Pakistan to disregard the agreements reached by two elected leaders and sabotage their implementation,” he said, adding that India remains committed to discussing issues with Pakistan peacefully and bilaterally. “In fact, we took the initiative to engage at Ufa. But, unilateral imposition of new conditions and distortion of the agreed agenda cannot be the basis for going forward,” he said. Responding to Swarup, Pakistan’s late-night statement said that for the NSA talks in Delhi, Pakistan had proposed a comprehensive agenda, consistent with the decisions taken by the two Prime Ministers in Ufa, which included discussion on all outstanding issues, including Kashmir, as well as terrorism related matters, and other issues such as religious tourism, release of fishermen and peace and tranquility on the LoC. “However, regrettably, the Indian side’s desire to restrict the agenda to terrorism-related issues only, amounts to a negation of the decisions taken by the two Prime Ministers,” the statement said. Last August, India had cancelled Foreign Secretary-level talks over Pakistan High Commissioner Abdul Basit’s meeting with Hurriyat leaders.